Painting of the Italian artist Pompeo Batoni “Achilles at the Daughters of King Lycomed”. The size of the painting is 170 x 121 cm, canvas, oil. Lykomed, in Greek mythology, the king of the dolops on the island of Skyros, the son of Apollo and Parthenope. Thetis, wishing to save the son of Achilles from participating in the Trojan War and future death, turned to Likomed for help. The king helped Thetis to hide her son Achilles during the campaign against Troy. Achilles, at the insistence of her mother, first hid among the royal daughters of Lycomedes, changing into women’s clothes. One of the daughters of the king, Deidamia, later gave birth to Achilles the son of Neoptolemus. Likomedes is also known by tradition as the killer of Theseus. To These Lycomedes, Theseus fled Athens, when the power was seized by Menesfei. Skyrosy well received Theseus because of his glory, and Likomed envied him. Wanting also to please Menespheus, Lycomedus treacherously killed Theseus, having pushed him into the abyss from the highest mountain of the island. 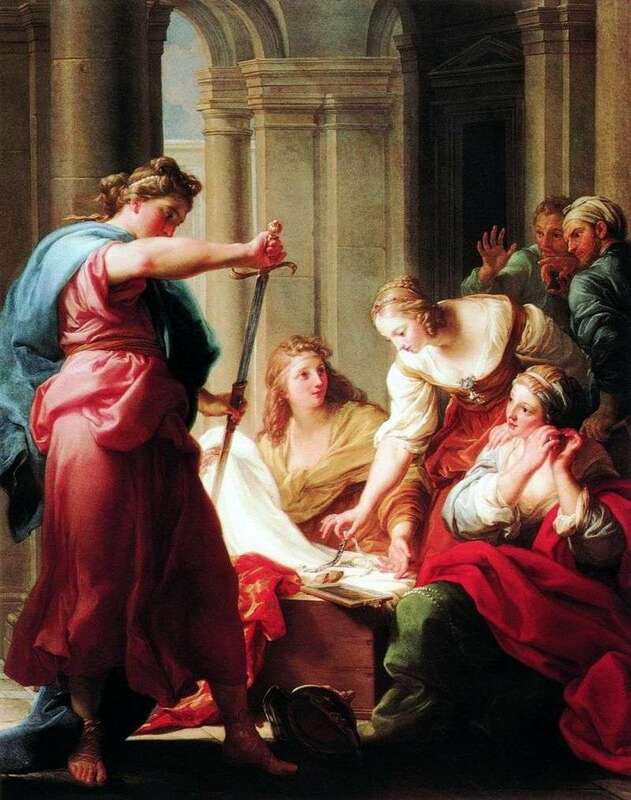 Description and meaning of the painting Achilles at the daughters of King Lycomed by Pompeo Batoni.